Copy across all customer defaults to SFE-C and D.
Edit customer defaults to read new contract codes. Step 1: Copy across all customer defaults to SFE-C and D.
Filter Market Column = SFE. Ctrl + A to select all logins (list will turn blue). Click Ok in the dialog box that states you are about to edit multiple records. 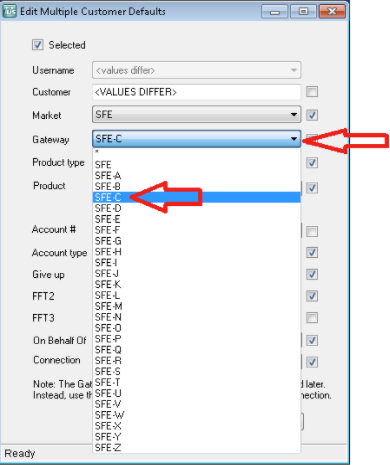 Click ‘Gateway’ column, select ‘SFE-C’ and click 'Save'. Back in the customer defaults window, you will see ‘SFE-C’ in the gateway column.